This mod allows you to write a novel without using a computer. Great for your historic hoods, or generally poor authors who can't yet afford to buy a computer. It takes the form of a manuscript notepad which your Sim (of any age Child and older) will spend many hours writing their creative thoughts in (and gaining creativity skill points) until the novel reaches completion. Exactly as the computer version does, this will take approximately 15 Sim hours, where the Sim can stop writing and contuinue later as many times as required. Once complete, the manuscript should be posted to a publisher, and after which time you will receive a telephone call telling you how good your novel is. If you don't receive a phone call and you are on an Apartment Lot, you likely need the fix here. The Sim will automatically post (mail) the manuscript to the publisher when done, but if you cancel the operation, then a menu on the manuscript will allow it to be posted (mailed) later. There is a Base Novel Worth of $200. Added to that is a Random Additional up to $1000. Added to that is an Extra $100 Per Novel Sold (calculated from a hidden Misc Skill of "Novel Writing"). Added to that your Sim's Creativity Contributes up to $2000, pro rata to the amount of creativity skill they have. For memories and want satisfaction the amount of money your novel earns determines whether it is Lousy or Great. Lousy Novel is Worth <= $2000. Great Novel is Worth >= $2200. The manuscript can be bought from the Creativity sub-section of the Hobbies section in the Buy Mode catalog for $10. Children can also write a novel, but an older Sim will have to post it for them since they cannot reach the postbox. If you place the unwritten manuscript on a table or desk, the Sim will write sitting at that surface. If you place it on the floor, they will write it sitting on the floor. 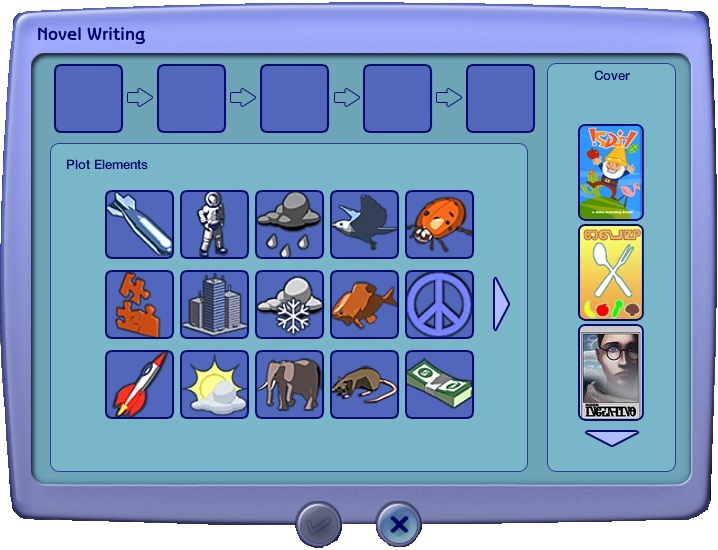 If you have the Freetime EP (or Apartment Life which also included the functionality) then when you begin to write your novel, you will be shown a dialog box which allows you to choose the cover art for your novel and the plot lines within it by means of choosing icons. Once the novel is complete you will be asked to customize it in another dialog by giving it a title and a brief description. Once the manuscript is posted you will be delivered a copy of your final published novel. With these EPs you also get the Want satisfied "Write a Novel" and with FreeTime specifically a memory of writing your first novel. If your half-finished version 1 manuscript is still in the house that the author lives in, everything will continue properly without any intervention from you. You can move house with the novel so long as you enter the house and allow some time to pass in live mode before moving. If your half-finished novel is in a different house from where the author started writing it, you will see a menu that can only occur in this situation which allows you to reassign the owner to anyone currently in the house. If your half-finished novel is in a different house than the author, you can invite them round and use the pie-menu to reassign the owner, and then give them the manuscript to take home or make them selectable long enough to put it in their inventory. New manuscripts that are bought from the catalog are now deletable, existing ones are not because they have already been initialised. This is a completely stand-alone object which shouldn't clash with anything else. Made manuscript recolourable. Only the cover is recolourable, the inside of the pad I have not made recolourable as that is changed from blank to "written on" by the internals of the object. Fixed the rate at which the creativity skill is earned. It was supposed to be exactly as the computer but I made an error. It is now exactly as the computer. Thanks to reggikko for spotting this and letting me know. Changed the way the owner Sim is recorded in the manuscript so that even after moving house, the Sim can still continue the novel. Added "Scrap Novel" pie-menu, so that if the author moves out, the manuscript can be scrapped and a new novel started in it. You can alternatively give the manuscript to the owner, as a gift or temporarily make them selectable so that you can put the manuscript into their inventory. Arms no longer stay at 90 degree bend after putting manuscript down when writing on floor. Caught a few 'jump bugs' when writing on floor. Fixed Jump Bug when novel was unable to be put back onto table/desk because something else (homework or food) is now there. Manuscript will be placed on the floor instead. Fix the fact that the novel victory incoming phone call did not tell you the price achieved by your novel. Fixed Maxis Bug: Apartment Lots ... any incoming calls?